June in my garden offered a plethora of colorful, diverse, and interesting clematis, including the last of the large-flowered bloomers, early blossoms from July bloomers, and three beautiful clematis bell flowers, two of which are home-grown seedlings of the dainty scarlet bells of Clematis texensis. C. ‘Tartu’ still going strong in June! C. ‘Morning Mist’ with C. ‘Proteus’ in the background. 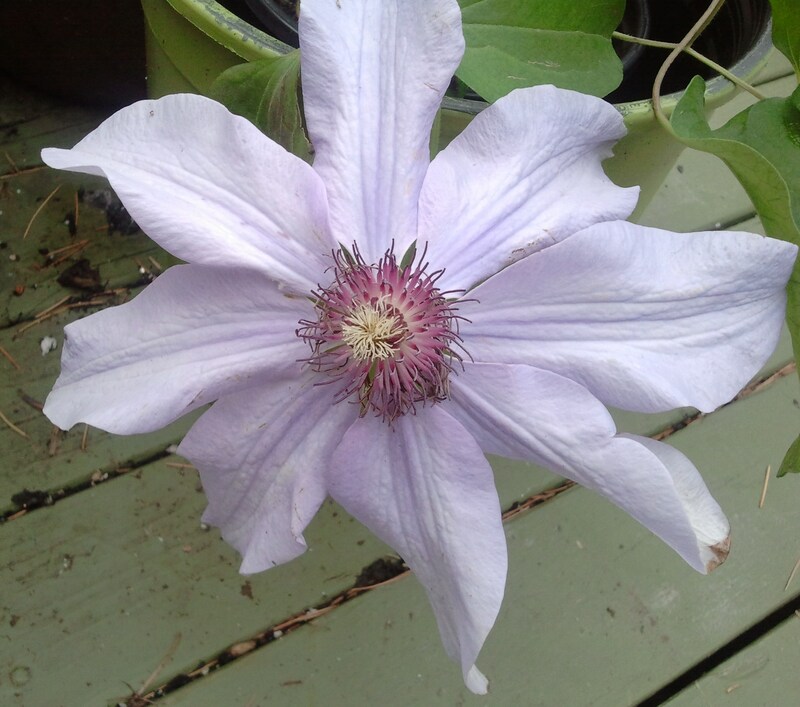 One flower of C. ‘Morning Mist’ measured 10 inches in diameter this year, the largest clematis blossom in my garden. The plummy C. ‘Lord Hershel’. 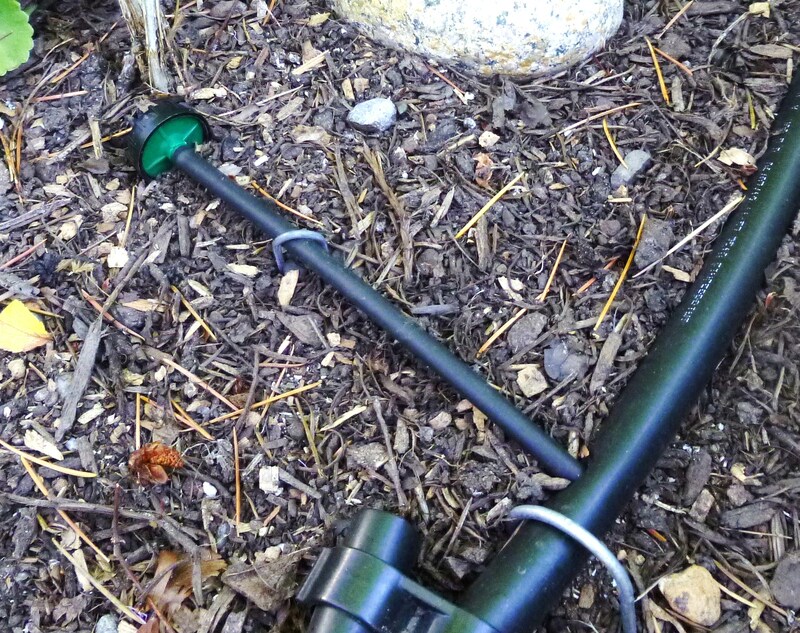 Not being a climber, this one lounges around on whatever it can find unless you truss it up. C. ‘Fujimusume’ is one of my personal favorites. Satiny sky blue! C. ‘Proteus’ glows in a fabulous muted pink. Who could count the petals? My own fantabulous C. ‘Fond Memories’ blooming in June. Ahhhh. Above, the complex blooms of C. ‘Crystal Fountain’, also known as C. ‘Fairy Blue’, just beginning to open. And here they are, fully open. Beautiful either way! The purple-leaved C. recta ‘Purpurea’ flouncing in the garden and emitting its delicious fragrance. The mauve blooms of C. ‘The First Lady’ poking up in the back join in the fun. C. florida ‘Sieboldii’. 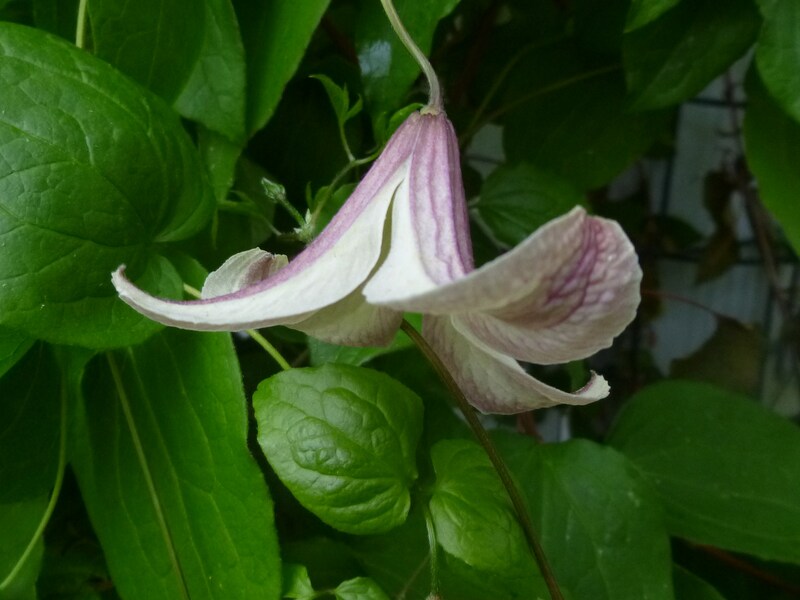 I have two plants of this clematis. Both were sold to me as C. florida ‘Sieboldii’, but they look quite different. This one has a smaller, darker center. Both, however, stop visitors in their tracks. C. ‘Polish Spirit’ already loaded down with flowers and buds, though it’s still only June! 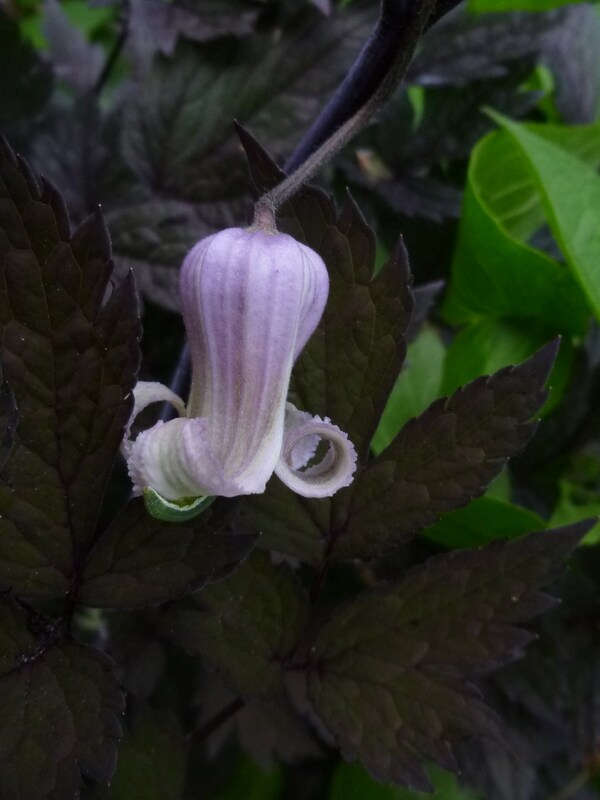 Clematis Climador ‘Koenigskind’ is free-flowering on a compact plant. A classic from the late 1800s, C. ‘Perle d’Azur’ always delights the eye. Show stoppers C. ‘Etoile Violette’ (dark purple) and C. ‘Betty Corning’ (mauve bell) just beginning to strut. They bloomed together for more than eight weeks during the summer, starting in mid-June. I guesstimate that each of them graced the old dead plum tree that supports them with 3,000 – 4,000 blooms through the season. Amazing! 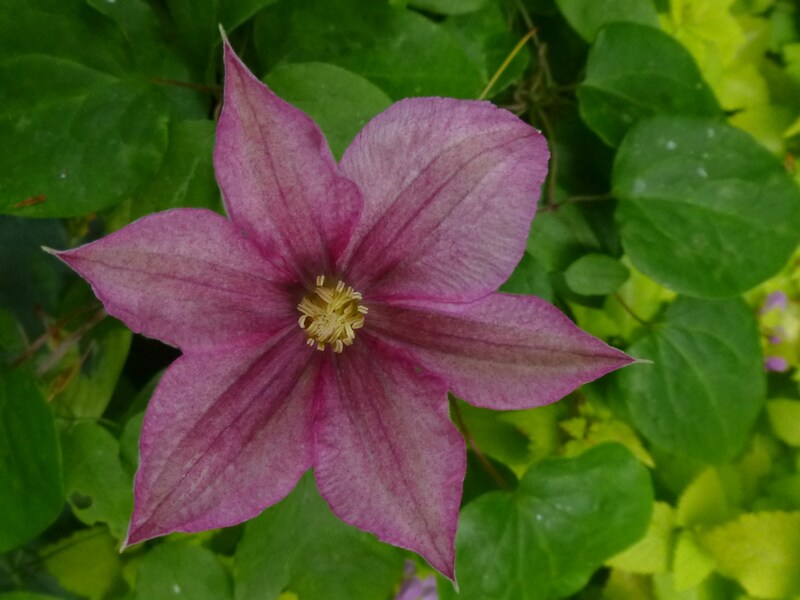 Clematis ‘Princess Red’, a Japanese hybrid of the American native, C. crispa. The dark pink color might come from a bit of C. texensis (a red-flowered US native) in it’s DNA. What a gorgeous flower. An elegantly shaped dusky pink flower on a C. texensis plant that I grew from seed received from the British Clematis Society. Also a plant I grew from seed, this one is similar to a well-known texensis hybrid, C. ‘Etoile Rose’. Mine I think has more of a twist in the petals. Proud mama. 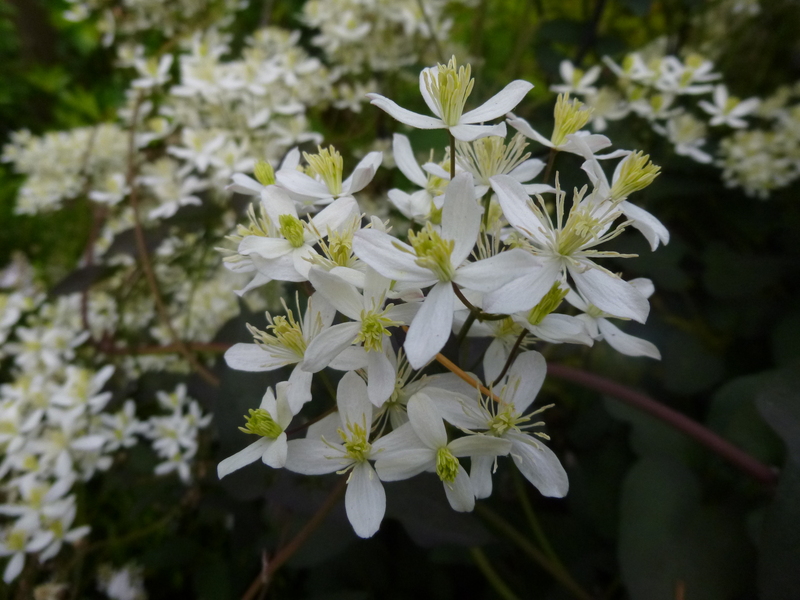 With the exception of two recent additions, I have unfortunately been delinquent in posting about clematis for several months–blooming months at that! My camera, however, was still clicking away. 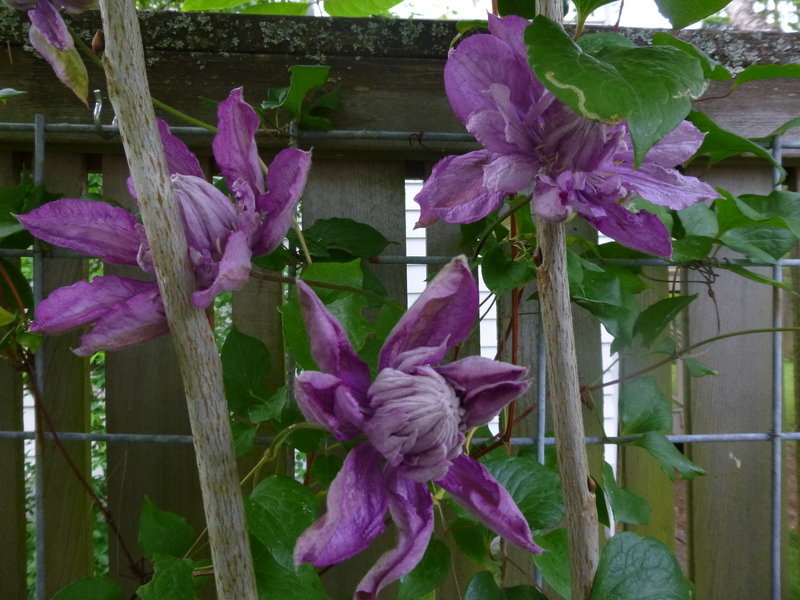 Below are a few of the beautiful clematis I came upon, in my own garden as well as others, during April and May of last year. C. ‘Joe Zary’ blooming in full sun in April. If it were in more shade, the color would be stronger. The delightful and delectable C. ‘Asao’. Such lovely shades of pink and sometimes semi-double. 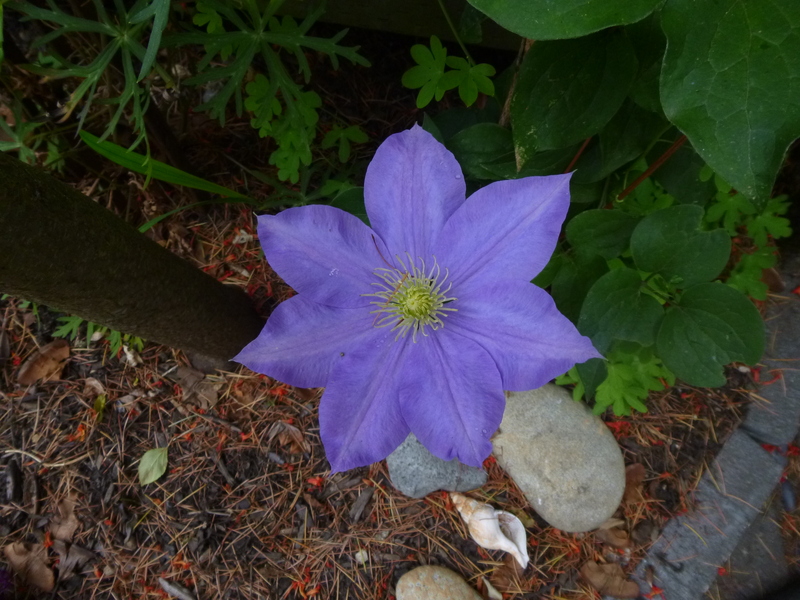 This one is always one of the first three large-flowered clematis to bloom in my garden. Early blossoms of C. Josephine ‘Evijohill’. Always a heart stopper! Clematis ‘Sugar Sweet Blue’ wafting its fragrance on my deck, backed by a stunning Chilean Fire Tree (Embothrium). 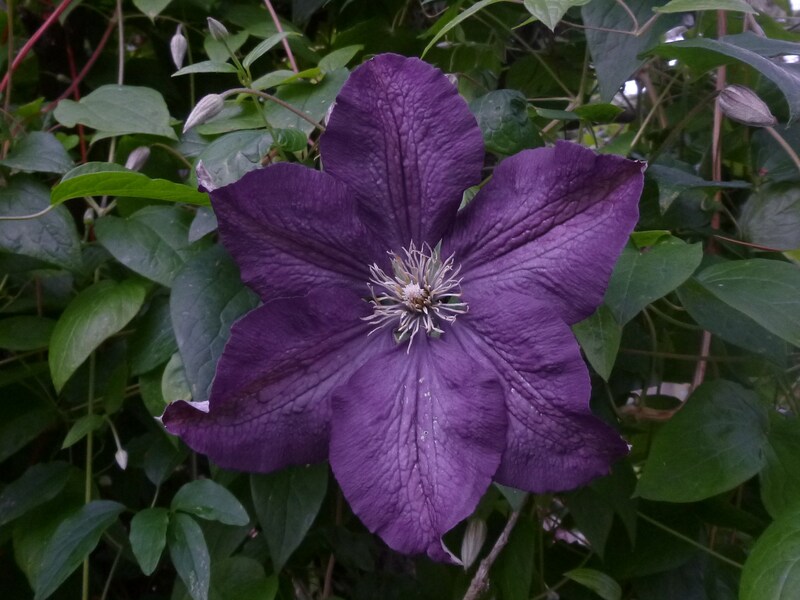 C. ‘The First Lady’, one of only a few clematis actually hybridized in the US. I don’t know which First Lady was meant to be honored with the name, but I think of my personal favorite First Lady whenever I look at it. C. ‘Silver Moon’ looking ethereal in the shade. C. ‘Ken Donson’ strutting his stuff. The redder than red C. ‘Rebecca’! 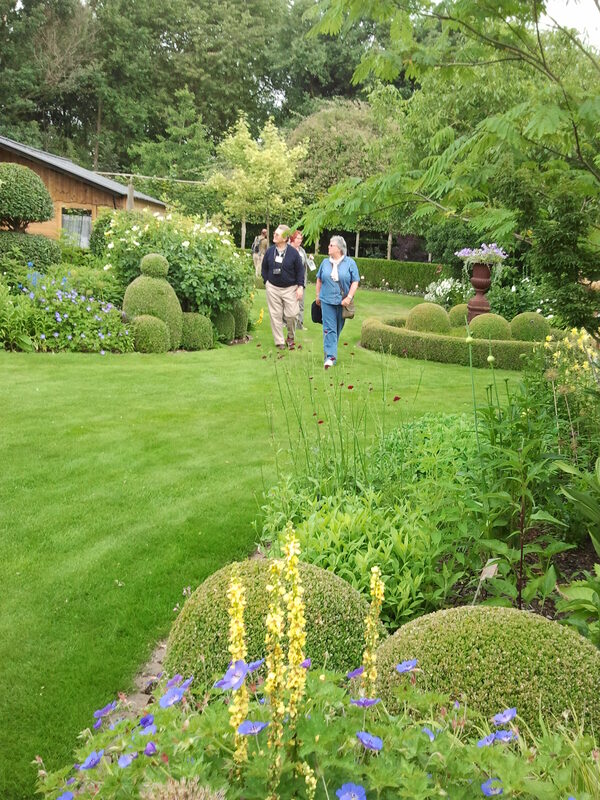 A visit to C. ‘Duchess of Edinburgh’ on a garden tour. Oh, be still, my heart! C. ‘Fond Memories’ while on a garden tour, gloriously blooming before my own even started. Definitely one of my favorites! Still touring gardens–C. ‘Nelly Moser’ or one of her imitators. Another C. ‘Nelly Moser’ look alike spotted while garden touring. Could be C. ‘Bees Jubilee’. Back home to find C. ‘Tartu’ blooming away. Love the two-tone ruffly look. Each clematis has its very own emitter! Life is good. My friend Sean helped me (uh, well, actually, I carefully watched him) put in a drip system for my clems and all my pots. I am in heaven. With the dry spell we’ve been having, I have NOT had to spend hours (sometimes DAYS) watering. YayHA! Thank you, Sean. He showed me how to tweak the system myself, and I plan to make some tweaks this weekend. Hmmm, we’ll see how that goes. Yes, it’s true. There actually is an annual international conference where clematis enthusiasts from all over the world gather together to immerse themselves in clematis for a whole week. Later this month I will be heading to southern Germany to attend my third conference (the other two were in Portland, Oregon, and Belgium). Now, I know you are probably imagining us sitting around in a stuffy conference room listening to erudite lectures about obscure clematis. Oh, no, each day all 60 or 70 of us visit two to four gardens and nurseries together–punctuated with rest stops for delicious food and drink, amid comraderie in a multitude of languages. 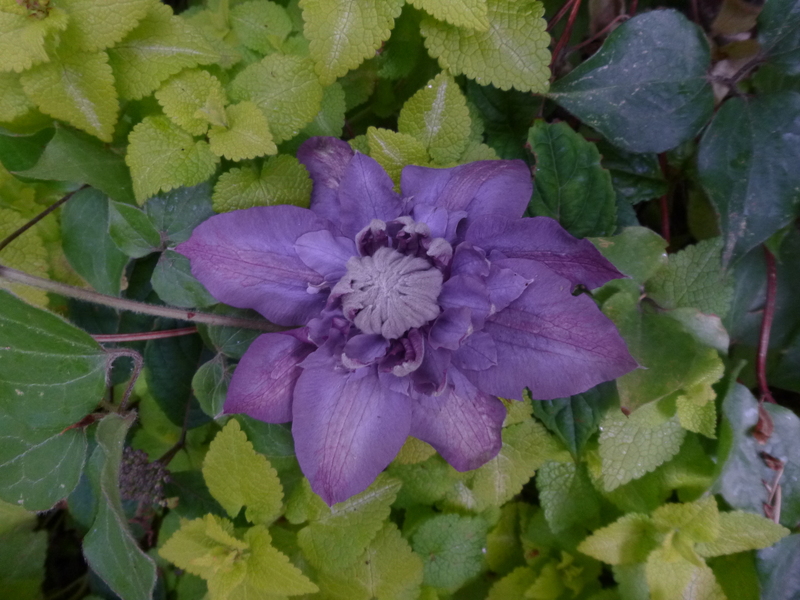 But just imagine our consternation when, once in a while, we visit a garden with no clematis! Though we are able to enjoy the garden anyway, we are mystified that a gardener could actually neglect to weave at least one clematis into the garden design. We might even find a little time for one of those erudite clematis lectures, too. I plan to take lots of photos and hope to post from Germany, so keep a lookout (I’ll be in Europe from June 27 – July 11). Clematis Caroline, just starting her show. Now all my clematis are in the ground! Yippee! I managed to plant the last six between downpours a few days before Christmas. 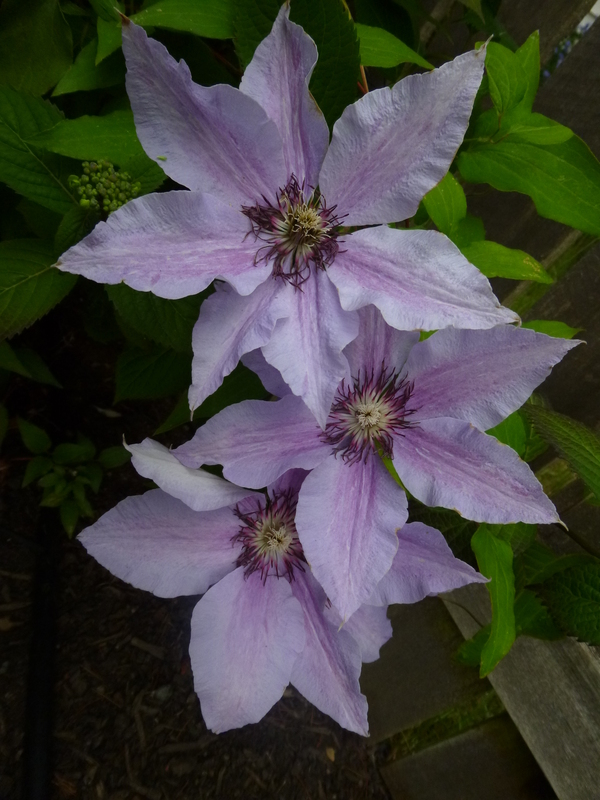 One of them, Clematis Rhapsody, is obviously misnamed. 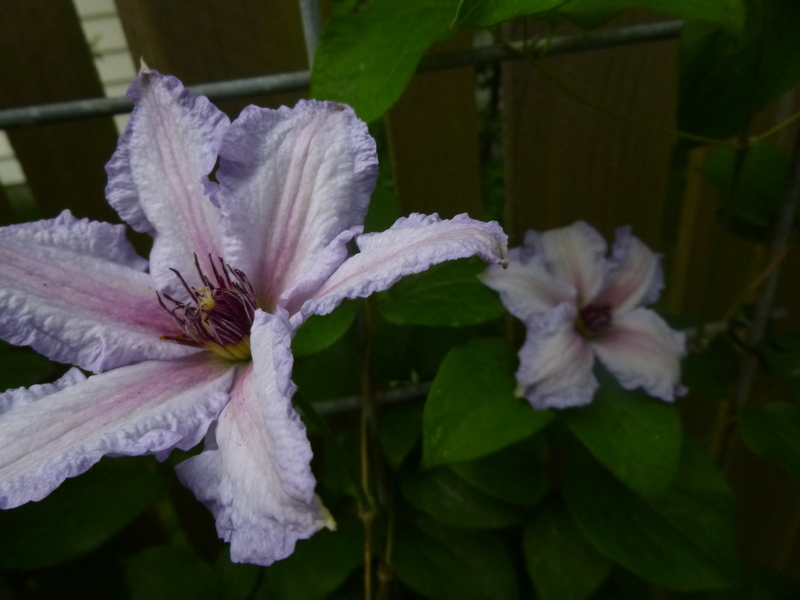 When I bought it late last spring — the flowers were HUGE and the bloom was a luscious light mauve with a reddish boss. I simply couldn’t resist. But in the process of planting it the other day, between a dwarf Pieris and a variegated Fatsia along a fence, I looked it up on Clematis on the Web on my smartphone to see what exposure it needed. Lo and behold, I realized that my plant is certainly NOT Clematis Rhapsody. 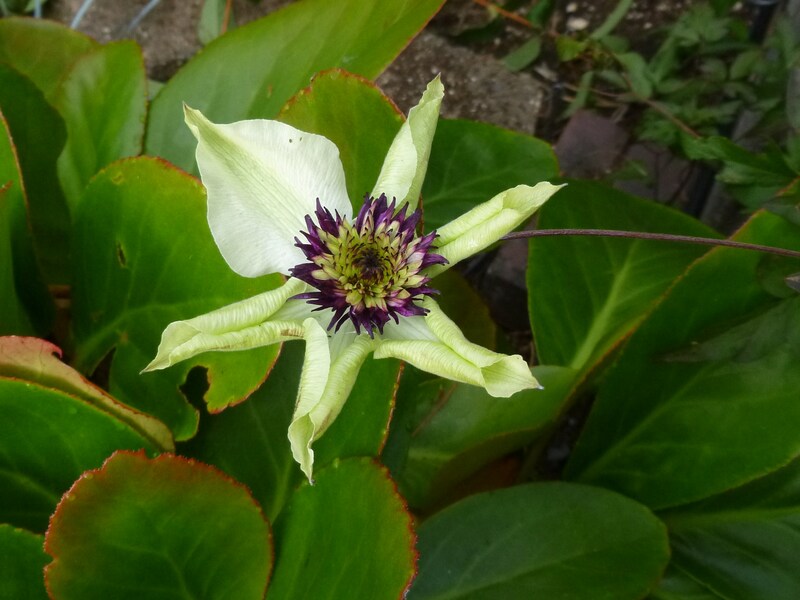 The first photo below is of my clematis blooming in its pot last June. 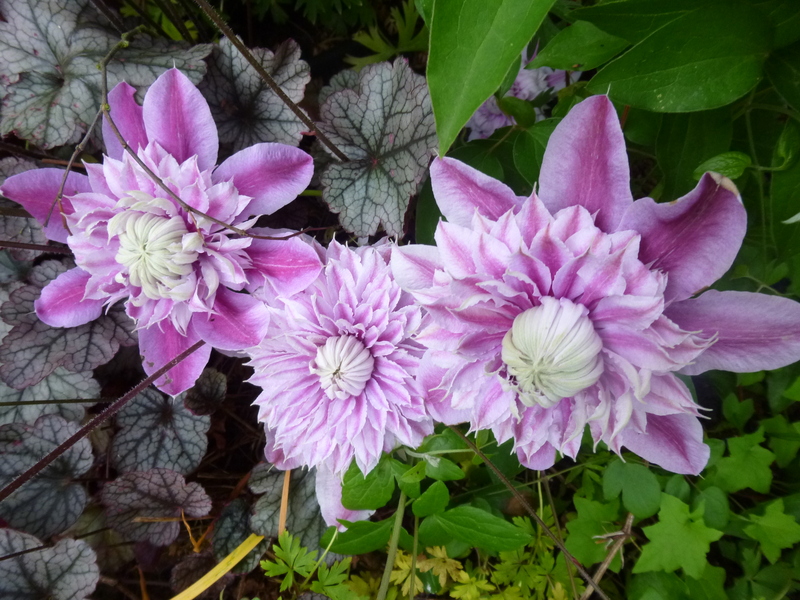 The other photo is the real Clematis Rhapsody–deep purple with a white boss. Hrmph. 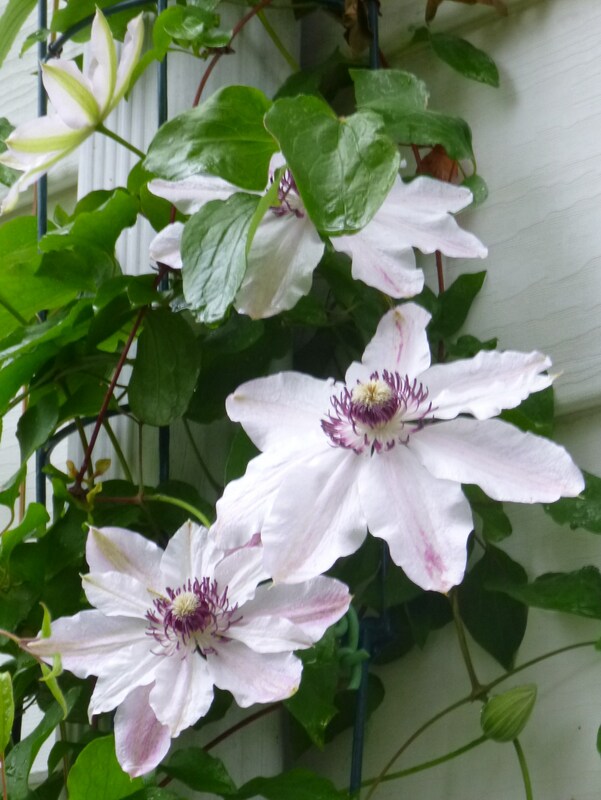 Unfortunately, this problem of misnamed clematis is not an uncommon occurence. 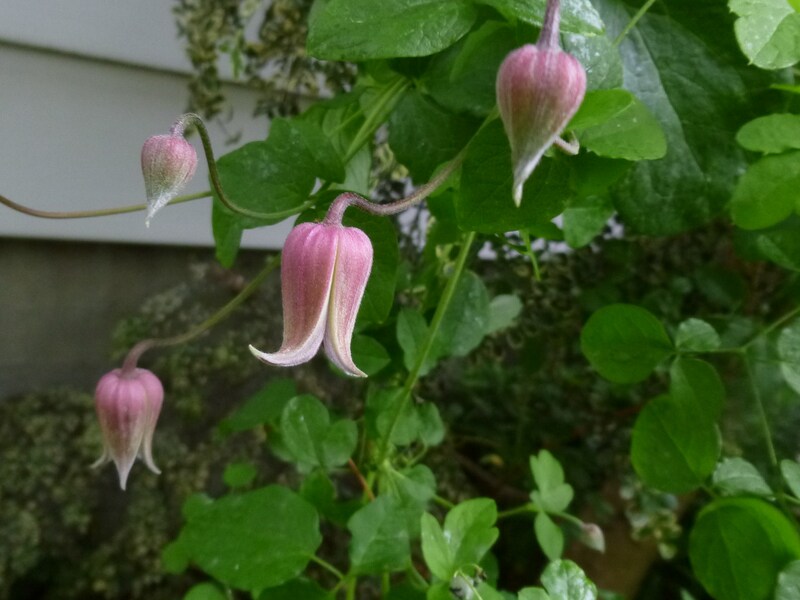 If you can identify my lovely unknown clematis — please let me know! My Plant that is supposedly C.
The other five clematis I recently planted are listed below with links to photos and descriptions on that fabulous website, Clematis on the Web. 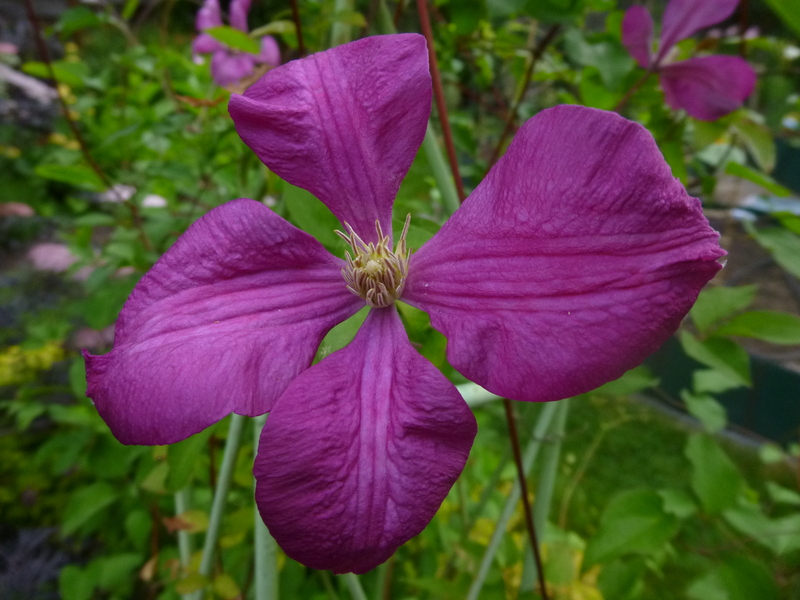 This website has incredible information and usually photos of thousands of clematis! I can spend hours diddling around there. I also use it when I’m at nurseries to look up a particular clematis. I can find out how the blooms look, when it will bloom, how to prune it, and lots more. Now that all my clematis are planted (except for three that are still to small to be planted out), I guess I’ll peruse my favorite mail-order clematis nurseries. I’ll be telling you more about them later.